Please continue reading by scrolling down this page until you come to your desired treatment, or give us a call at 917-703-7069 to schedule a personal consultation. You may also want to visit our gorgeous Before & After Photo Gallery for pictures of real results from real patients in our practice. How do nonsurgical skin tightening technologies work? What are the laser skin tightening options at MAS? What is the most effective laser skin tightening procedure? What areas of the body can be treated with laser skin tightening technology? Can the deep heating technology of laser skin tightening devices be used to treat other conditions like migraine, sports injuries, and back pain? There are many different ways to tighten and heal the skin. It can be physically tightening with surgery. It can be ablated and forced to re-heal itself with laser skin resurfacing or chemical peels. Or it can be heated from the inside out using technologies that are exclusively deigned to tighten the skin without producing any surface improvements like the other treatments mentioned above. Heating the deepest layer of the skin (the dermis) is a tricky process that not many laser companies have been able to complete successfully with their technologies. A tremendous amount of energy must be delivered to the dermis in order for it to have any noticeable tightening effects, but that energy must pass through the top layers of skin without damaging them to keep the downtime minimized. This process is much more difficult than it sounds, and that is why most of the current laser skin tightening technologies can sometimes fail to produce impressive results. However, there are a handful of skin tightening platforms that have higher success rates than others, so keep reading to find out more about which technologies we offer in our practice, or give us a call at 917-703-7069 to schedule a consolation with Dr. Vendemia and learn about all of your skin tightening options including surgical options, nonsurgical options, or combination treatments. What are the skin tightening options at MAS? 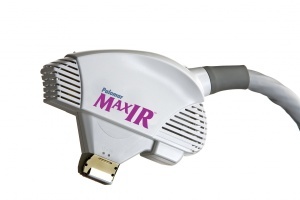 The MaxIR Infrared Laser Skin Tightening System from Palomar Medical: We chose the MaxIR System from Palomar Medical for our nonsurgical skin tightening clientele because it is the only system that uses infrared energy. The other systems mostly use a form of ultrasound which we believe to be less effective than the deep-penetrating heat of the MaxIR Infrared system. Another benefit of this deep heating technology that many of our cosmetic clients choose to take advantage of is it’s ability to treat a variety of non-cosmetic ailments like migraines, plantar fasciitis from high heels, and muscle injuries from exercise or sports. There is no other skin tightening technology that is so effective and yet so versatile. Fiberoptic Laser Skin Tightening: This skin tightening procedure is classified as a non-invasive surgical treatment. A small 2.75mm fiberoptic cannula is passed just underneath the skin to heat the dermis to a uniform temperature of near 40 degrees Celsius for the most effective skin tightening possible. The only difference between this treatment and the MaxIR is that this method requires a few very tiny (less than 1/8th inch) incisions for the cannula to pass through in a manner that is very similar to laser liposuction procedures. Direct heating of the dermis with a fiberoptic cannula is far more effective and predictable in it’s ability to tighten loose skin, and the results can usually be accomplished in a single treatment as compared to a long series of expensive individual treatments that are required for all nonsurgical skin tightening treatments. And even though this method is classified as a non-invasive surgical procedure, it can commonly be performed with just local anesthesia in the office, and the downtime is no more than a day or two for most patients. Surgical Skin Tightening: Surgical skin tightening is an option for almost any body area, including the face, neck, breast, abdomen, arms and thighs. Surgery will always be the most predictable and guaranteed method of tightening the skin, but it does involve additional downtime and cost. Are you considering nonsurgical skin tightening in New York? We offer the most innovative technologies and the quickest recovery times, and all treatments are performed by a physician for added safety and comfort. Please feel free to contact us online or call our office at 917-703-7069. The most effective way to use skin tightening technology is to combine the external infrared heating of the MaxIR with the internal fiberoptic heating into a single procedure. The fiberoptic dermal heating is usually performed first under local anesthesia, followed by the first session of MaxIR infrared heating 4-6 weeks later. MaxIR sessions are usually continued at intervals of 4-6 weeks for an additional 2-3 sessions to maximize the amount of skin tightening. The MaxIR is tremendously more effective at tightening the skin if the dermis has been heated directly from the inside with the fiberoptic cannula before the treatment series begins, and a this procedure has been used to successfully tighten the neck, arms, abdomen, and thighs, and has also been shown to reduce cellulite. Face, eyes, and neck. Special attachments can be applied to the MaxIR to treat fine lines, wrinkles, and loose skin around the cheeks and eyes, or to tighten a sagging neck in a man or woman. One of our most popular combination procedures is the Botox Laser Eye Treatment that tightens the delicate skin around the eyes while reducing wrinkles and relaxing tight brow muscles at the same time. Arms. Loose sagging skin on the back of the arms can be tightened with a combination of MaxIR therapy and fiberoptic internal heating. A small amount of liposuction can also improve the contour of the arm in certain cases. Breasts. A series of MaxIR treatment sessions can tighten sagging breast skin as an alternative to breast lift surgery, or as an adjuvant treatment to assist in skin tightening after breast implant removal. Abdomen and Love Handles. Loose sagging skin on the abdomen and love handle areas can be tightened with a combination of MaxIR therapy and fiberoptic internal heating. A small amount of liposuction can also improve the contour of the waist in certain cases, and laser stretch mark treatments can also be added. Buttocks, hips and thighs. Sagging skin on the lower body can be treated with the MaxIR system, but it usually takes a longer series of treatments to see results in this area because of the thickness of the skin. Cellulite can be treated quite effectively with a combination of MaxIR therapy and fiberoptic internal heating. Chin, elbows, and knees. Sagging or loose skin can be tightening on micro areas of the body like these, and in some patients the fiberoptic laser cannula used in Micro Liposuction can produce an enhanced result. Joint and Muscle Pains. Intense subcutaneous heating has long been known to be beneficial for acute and chronic joint and muscle pains, but the infrared delivery system takes this process to new levels and makes it a useful tool for sports injury rehabilitations of all types, including muscle tears and sprains, joint injuries, or common muscle fatigue after intense competition. Runners, athletes, and weekend warriors can all benefit from this unique treatment modality. Chronic Back Pain. Anyone who has ever suffered from chronic back pain knows the feeling of relief when an external heat pack is applied, but the deep-penetrating heat of the MaxIR takes this to a new level. The infrared laser heat not only feels quite good, but also increases circulation and relaxes tense muscles for extended relief. Plantar Fasciitis. This is a common condition among women in New York who wear high heels every day, and the MaxIR can help with the pain and inflammation on the bottom of the foot by stimulating increased circulation and relieving the painful spasms of small foot muscles. Migraines. Infrared deep heating of the temporalis muscle and scalp can produce some relief for migraine sufferers, especially when combined with our exclusive Botox for Migraines procedure. We have migraine patients from all over the country travel to New York 2-3 times a year for this combination because it is so highly effective, even for the worst cases of migraines that have not responded to many other forms of treatment. TMJ. Deep-penetrating heat applied to the masseter and temporalis muscles has been shown to provide some level of relief for patients with mild-moderate TMJ symptoms. Post Liposuction Recovery. Deep subcutaneous heating can be used to speed the recovery process, and provide further skin tightening, after liposuction procedures. Are you considering laser skin tightening in NYC? We offer the most innovative technologies and the quickest recovery times, and all treatments are performed by a physician for added safety and comfort. Please feel free to contact us online or call our office at 917-703-7069.